After surgery, my health has rebounded. For the first time in 16 years, I am not taking any medications (that, after years of taking medications that would be billed to insurance sometimes at over a hundred thousand dollars per year)! I went from a paltry 144 lbs to a healthy new normal of 165. (I used to hover around 170... apparently a colon weighs something like five pounds 😜). This year I wanted to spend more time than ever focusing on people. One of my little hobbies at DrupalCon—mostly since my face and name are often recognized and so it's hard to do—is to try to talk with at least two or three people who have never heard of me each day, and spread some of the infectious joy and passion that I see in good open source communities. Drupal's community is not perfect. Far from it. We've been bruised, beat up, and we're still flailing about here and there as we resolve internal and external conflicts. But there's a name for an imperfect group of people who come together and work things out, and still show compassion and kindness for each other (even in cases of severe disagreement): a family. And Drupal being the first major open source community I encountered—really, the reason why I dove headfirst into open sourcing practically everything I do—DrupalCon is kind of like my family reunion. Everyone I know in the Drupal community (including those who never get to show up at an event like DrupalCon) has stories of 'that time so-and-so helped me get out of a bind' or when 'maintainer such-and-such was extra patient and helped me resolve this issue'. There's a reason our unofficial slogan is come for the code, stay for the community. Even in the midst of the sea change brought on by Drupal 8, the community (whether local, national, or international) persists. But this community is fragile, and fractures have had a chance to form over the past few years. I really hope that those fractures can be patched over soon. 2019 marks my return to joining the volunteer photography team, led by Susanne Coates (susannecoates), Paul Johnston (pdjohnson), and Michael Cannon (comprock). Last year there was no chance I could lug around even a small lens for a day. This year I changed that dramatically by lugging both my monster 14-24mm f/2.8 lens (used to take the 2019 DrupalCon Seattle group photo) and my 70-200mm f/2.8. Oh, and also my little Sony a6000 which I used for more candid shots! Taking photos is a fun (but crazy expensive 🙃) hobby for me, and I am happy to share my photo equipment and time to help contribute images the Drupal community can use to remember the event forever. Heck, this year I even smiled sometimes! He mounted the venerable Nikon 24-70mm f/2.8 G lens by way of a Z-to-F mount adapter, and though it masks the compact nature of the Z-series, a good lens like that showcases the excellent quality of the new mirrorless cameras. It looks like Dries has been making good use of the camera too, at least if these few samples are an indication. I remember images vividly, and they are the best reminder of the times I've had at an event like DrupalCon. I hope to continue contributing photos at DrupalCon and regional Camps I attend for a very long time! Thanks to all the other members of the photography team, especially the 'shepherds' listed above who helped coordinate a complex, multi-location, multi-day event. Sessions - Kubernetes, Drupal on Raspberry Pi, and Local Development, oh my! Being on the photography team was not enough, though... I decided to help with not one but two sessions this year. Lucky for me, Chris Urban took the lead on the now-running-for-two-years What Should I Use? 2019 Local Development Survey Results session. The results were a little surprising, to say the least! Speaking of surprise, I was actually late to that session because of calendar issues on my part, so a triple thanks to Chris for taking charge on that and covering for me while I ran up the escalators. The other session was actually the first time I was able to present on a topic near and dear to my heart at DrupalCon. I chose a 30 minute session because 90 minutes felt too long, though I really wish I could've had 45 or 60 minutes to go into a smidge more depth. But I was able to cram a fun demo and a few gags into my session, and I think people enjoyed it. Well, at least they were laughing at something 😆. You can check that session out here: Everything I know about Kubernetes I learned from a cluster of Raspberry Pis. I usually have a policy of only doing one session per conference, but as Chris was able to take lead on getting the survey up and running, publicizing it, etc., I was willing to expand that to two. I'm glad I did, it was a lot of fun to work with Chris on that 2nd session! I also attended two BoFs, one on Acquia BLT, and another on Kubernetes. Last year, my DrupalCon focus was improving the initial onboarding experience in Drupal core. This year I switched tracks and wanted to kick off some new discussion about Drupal, Kubernetes, and containers in production. This is an area that there's not a whole lot of prior knowledge in, and it seems most of the Drupal companies exploring Kubernetes are doing so somewhat independently. Also, there is little standardization in the Docker scene in terms of Drupal (how many CLIs do I have to use now, for various projects I work on? lando, fin, ddev, in addition to drush and all the other CLIs common in web development...), and I hope that we can do better there in the future. The Drupal Association recently announced that DrupalCon will become a coastal-city-centric event, alternating between the West and East coasts (and the middle of America will simply become 'flyover country' again, at least in terms of DrupalCon). I'm not super pleased about this decision, though I understand the financial and resource-allocation motivations. But it's one of those things that seems (to me, at least?) like it will reinforce the lack of cultural diversity in the community's geography. Yes, there is a statistically lower attendance when you go to a city where Drupal is not already 'hot'. But there are various cities in Canada and the many, many US states besides MA, CA, WA, VA, and NY which are up-and-coming in the tech world and could be rich new centers of Drupal development. Alas, it is not to be. At least not until 2025 or later, since we already have the schedule for 2020 (Minneapolis), 2021 (Boston), Portland (2022), Pittsburgh (2023), and Portland (2024). Worse than that, DrupalCon's shift towards more-expensive coastal cities further cuts down on diversity by excluding those who can't afford the monetary cost of attending in these cities. I could not personally justify attending DrupalCon were it not for the generous help of my company, Acquia. And in the past five years I've seen fewer and fewer independent Drupal developers (or developers who primarily work for non-profits and smaller agencies) at DrupalCon. I've tweeted about this before, but basically, DrupalCon NA seems to have 'jumped the shark' towards an enterprise focus in the past few years. Much of the community seems to have moved on to only attending more intimate (and infinitely more affordable) local or regional Camps. But this has implications for the community, as often (besides sporadic 'dev days' events) the nexus of Drupal Core community work and contribution mentorship—at least in the Americas—is DrupalCon. And if we exclude more and more groups of people (besides marketers, enterprise, and others who can expense everything on their trip), the Drupal ecosystem will suffer. When I started with Drupal, there were numerous prolific core contributors who worked independently or as part of some non-Drupal-specific entity. Nowadays, it seems the majority of Drupal core work is done by those who are fully sponsored by large Drupal agencies. While the latter can lead to more focus on specific large-scale initiatives, the former allowed Drupal to flourish more in a variety of use cases, as many other voices (which are absent now) were heard. Maybe I'm being a bit zany here, but I still think Drupal 8/9 has (or at least had?) a shot at being good at more than just 'ambitious digital experiences'. Anyways, let's move on towards this year's scenic location: Seattle! Some DrupalCon locations are great for the city's atmosphere (NOLA, Nashville). Others for their geography, or the culture of the area. Seattle has a lot of all these attributes. It's a bit expensive, but unlike some other locations, the geography and natural beauty are worth it! I stayed with relatives in a nice area across Lake Washington, and driving to and from DrupalCon, I was mesmerized by the lakeside geography, and one sneak peek (it was mostly foggy and cloudy... on clearer days it would've been more majestic) at Mt. Rainier. If I go back, I'm definitely going to make some time to visit Mt. Rainier; I just didn't have the time this trip. Also, there's plenty of interesting architecture when strolling through parts of downtown. And then there are fun and interesting places like the Pike Place Market, which is kind of a farmers' market on steroids. I know it puts the few we have in St. Louis to shame—though to be fair, we don't have fresh fish we can throw about here... unless you count fresh, muddy catfish! I tried waiting for a nice day without tons of rain and cloudiness to explore and take more photos... but that wasn't in the cards. Every day was a gloomy mix of half-rain-half-mist. I only barely caught a glimpse of Mt. Rainier on the way to the airport because visibility was not that great in the few daylight hours I was outdoors. 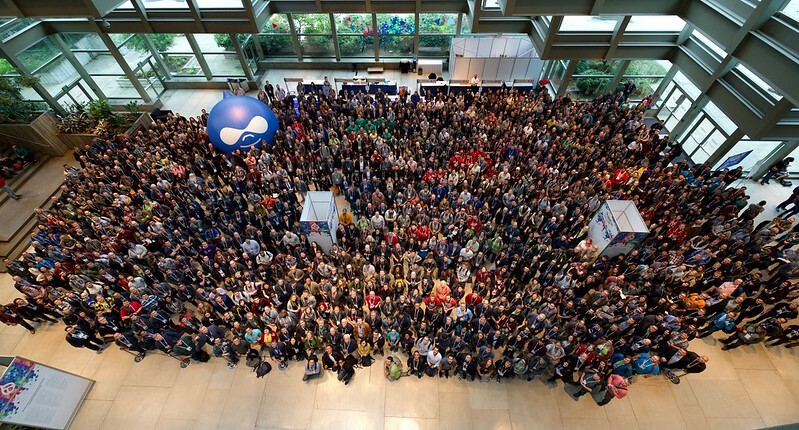 In the end, DrupalCon was a positive experience, and I enjoyed the community most of all. If they could just have Trivia Night and full-scale Contribution days all DrupalCon, I'd do it twice a year—I guess that's kind of how 'Dev Days' are structured, but then I'd also feel obligated to push more code, which feels more like work, rather than enjoy the company of the hundreds of community members I have come to know online. I hope to be back at DrupalCon next year, in Minneapolis; see you there! Great article, I have seen you few time walking around, and I was a bit shy to say hello. I hzve been using DrupalVM for quite sometime and wanted to thank you for maintaining it. it’s a great tool. anyway, I wanted to thank you for your contributions and next time I overcome my shyness and come by and say hi and Thanks in person. Did you think about visiting Drupal Europe in Amsterdam this year?